Thank you for all your lovely comments about my recent art journal page. I’m glad you enjoyed it. I have a couple more pages in process in my journals which I look forward to showing you in the future. I would love to hear from other art journallers. What are some of your favourite mediums and techniques? 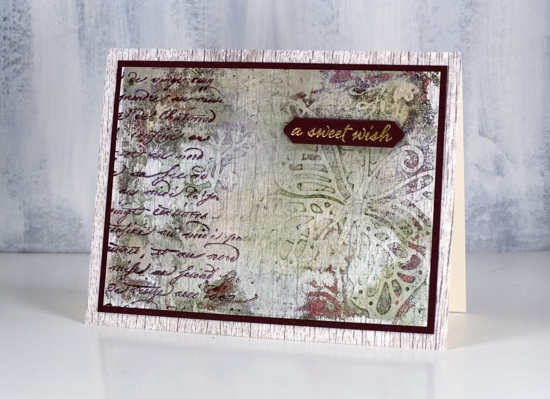 Today’s cards are made with my latest fave: the gelli plate! 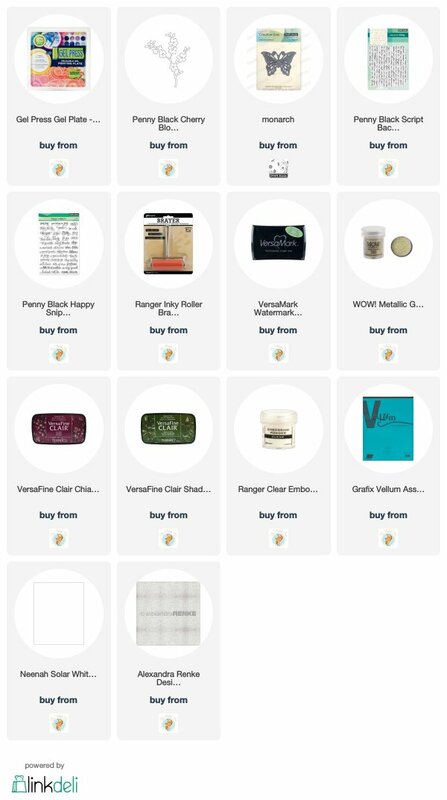 I am very much a beginner but learning as I go and watching the myriad of techniques shared on the Gelli Arts youtube channel. 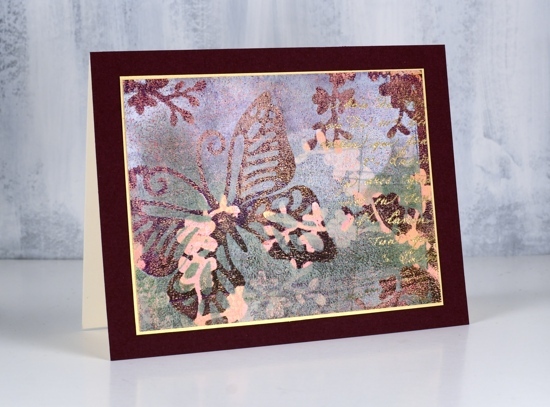 The panels in today’s cards were made by printing layer after layer while rearranging die cut paper butterflies and blossoms on top of each new layer of paint. The dies are Penny Black ‘monarch’ and cherry blossom’. I wont’ try to describe my process because I don’t remember exactly what my order was or what paint colours I used. I know there was green, white, burgandy, gold and pink liquitex basic acrylics but there could have been more. 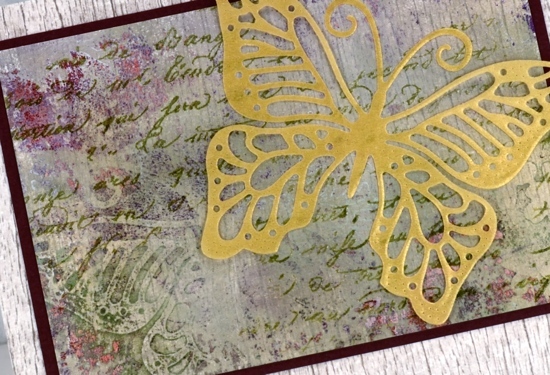 Like many artistic techniques success with a layered gelli print can be knowing when to stop. Once I was happy with the one above I still had paint and pattern showing on the gelli plate so I added one more layer of paint then pulled a ghost print (I’m learning the lingo!) on patterned paper. The paper I chose was a woodgrain print from Alexandra Renke. You can see the woodgrain print through the paint and pattern. I ended up matting both panels in burgandy cardstock then attaching them to a base panel of the same AR woodgrain paper. It’s always hard to capture shimmer on camera but all three panels have gold shimmer on them so I added some gold accents to each one. On the top panel I stamped the PB script stamp, embossed in gold powder and matted the panel with gold cardstock. 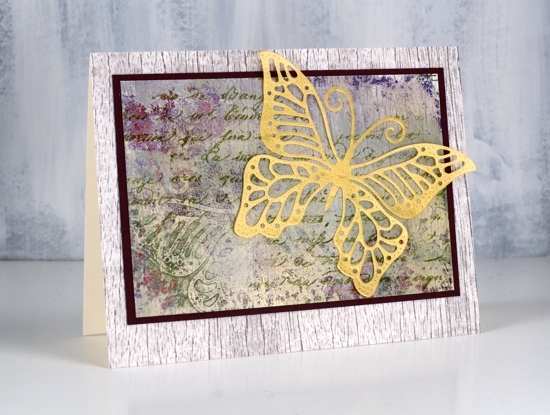 On the card above I added a gold embossed sentiment from the PB set happy snippets and stamped the same script stamp in chianti versafine clair. 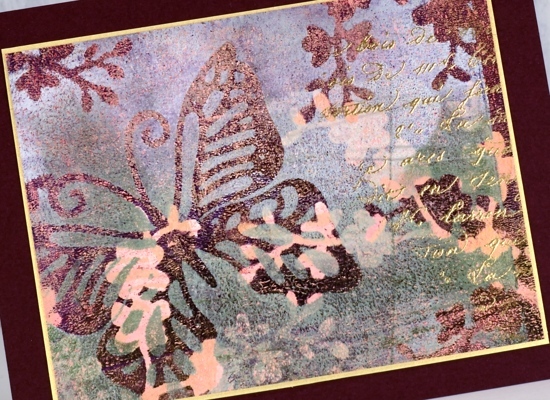 On the card below I stamped the script stamp in shady lane versafine clair ink and added a gold vellum die cut butterfly, the same butterfly used as a mask in the gel printing process. I did another butterfly and blossom print in a different colour scheme but I’ll share that another day. Thanks for dropping in. Talk about inspiration! What a glorious, never to be duplicated, piece of art! Lesson learned today: using printed paper for your print. Again, thank you for sharing and teaching by example. 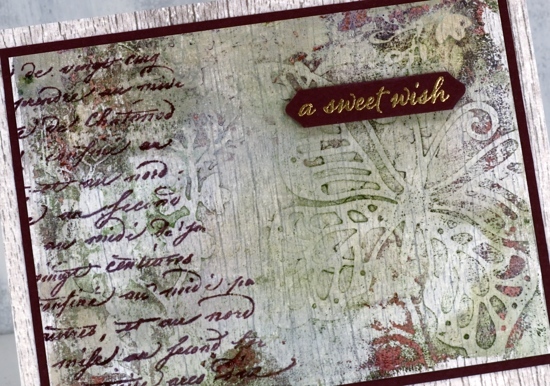 Thank you for sharing the brilliant use of printed paper for pulling the ghost print of the gelli plate, genius! Looking forward to seeing your further adventures into gelli world. WOW these are gorgeous! I think I need a Geli Plate!